This tall, male doll is one of many in the collection of Daddy’s Long Legs by Karen Germany. Sam is wearing a corduroy jacket with a small gold star. He has long grey pants with suspenders and a print shirt. His hair is made with wool. He is holding a Star News newspaper, dated Winter 1995, as he sits on a wood bench. His right leg is signed by the creator. Tag: "My name is Sam. KVK, Inc. Southlake, Texas, 76092. This doll is one of many in the collection of Daddy’s Long Legs. 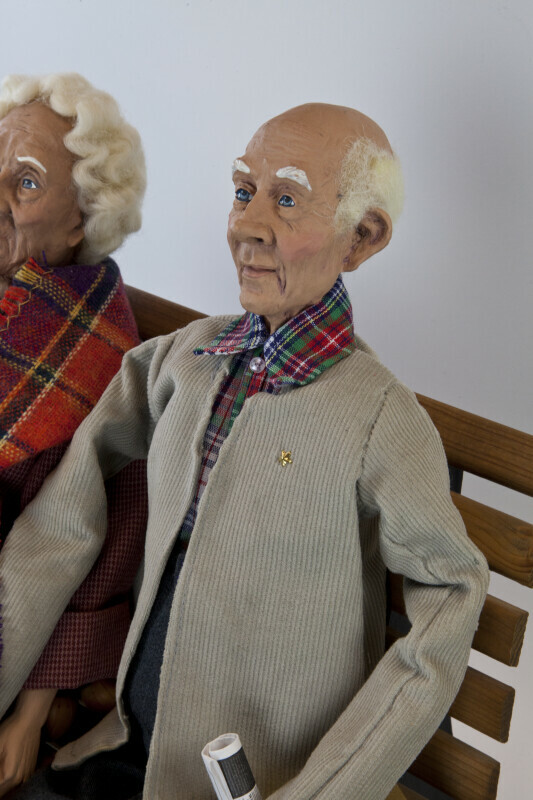 Each character is originally hand sculpted in clay, then reproduced in wood resin and individually hand painted by a staff of talented artists. Because of the popularity of Daddy’s Long Legs, new designs are being created with the collector in mind. The unique work of art, designed by Karen Germany, will become a treasured keepsake in your own private collection." The figure stands 18 inches (46 cm) tall.